SORRY - THE CSA IS SOLD OUT THIS YEAR. If a proposition or measure is not mentioned it means that we did not take a position. Please note that Democracy Unlimited only endorses ballot initiatives, not candidates. Temporary Taxes to Fund Education. Guaranteed Local Public Safety Funding. 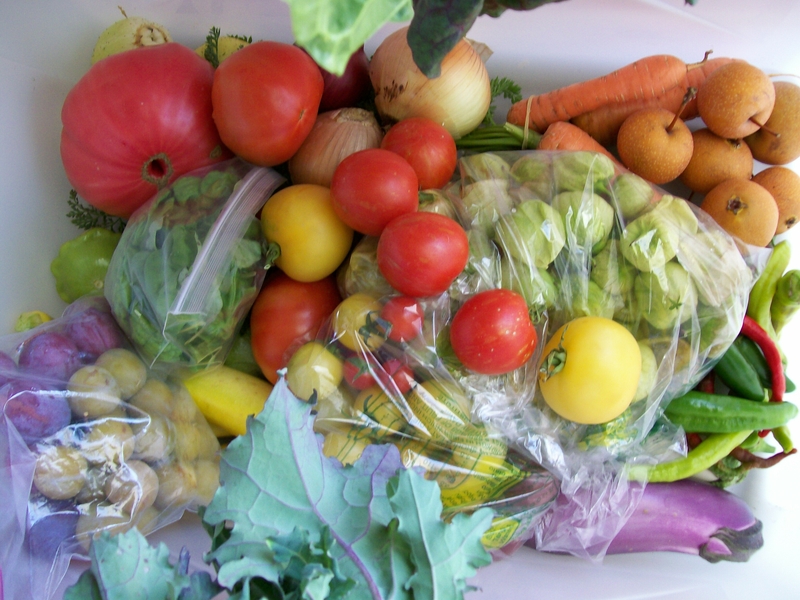 Beginning in June of 2012, a weekly box of fresh, seasonal, organic produce will be availabl e in Eureka or Arcata through a collaboration between Democracy Unlimited of Humboldt County and Green Fire Farm. Gain hands-on experience in community education and grassroots organizing as an intern for justice! Work on projects like the national Move to Amend campaign, the local Humboldt Independent Business Alliance, and others. September is Local Foods Month! Join the community for celebrations, challenges, and commerce supporting the production and distribution of food within the local bioregion. Sat, 9/10— Tour De Farms: A Farm Tour by Bicycle. Meet 4:30-5:30pm at Arcata Plaza. The Community Assistance Network in Crescent City oversees, which five community gardens, is planning a mini-conference for community gardeners on the North Coast. The conference will take place Friday September 23, and they are looking for people to give 40 minute presentations on a variety of gardening topics. Farmers and gardeners interested in organic seed production have the opportunity to learn important skills and connect with experienced growers next month in Humboldt County. 4th of July Events Planned - Join Us! July 4th and we need your help! Earthly Edibles Family Farm invites all those interested in food preservation to participate in a new type of Community Supported Agriculture (CSA) being offered this year. Members of the Canning CSA will receive a monthly box of produce and subsequent canning workshop where participants will learn four different processing techniques. Living Earth Landscapes invites the public to a free presentation on vermiculture basics on Saturday, May 14 from 12 to 1 p.m. at its nursery and water garden center located at 5307 Boyd Road (next to Three G’s Hay and Grain) in Arcata. Democracy Unlimited is Hiring an Outreach/Admin Assistant! Are you interested in working for social justice? Join our team! Democracy Unlimited is currently seeking an extremely well-organized and detail-oriented individual to support all of our outreach and administrative functions. Are You Seeking Training to Deepen Your Community Organizing Skills? Are you serious about taking back your community from corporations? Join us in Madison this Summer: Democracy Convention! This summer the first National Democracy Convention will be held in Madison, Wisconsin with at least eight conferences under one banner! Guest Carl Gibson is the founder of US Uncut, the grassroots, de-centralized movement organized to draw attention to the outrage of powerful US corporations that don't pay taxes.